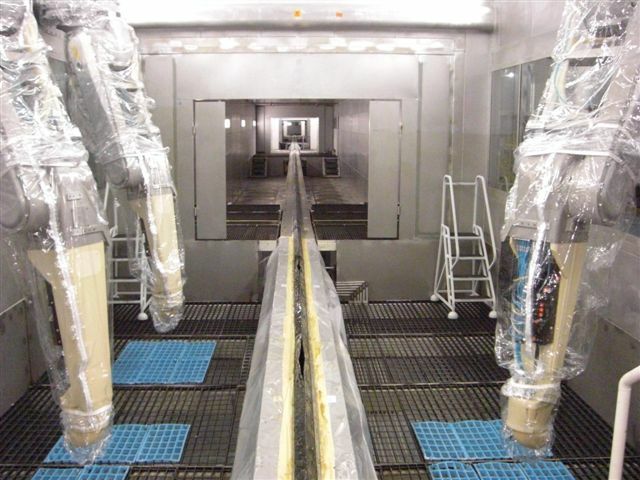 RobotSaver™ 4000 Paint Robot Cover is used by industrial paint shops to protect paint booth robots from overspray, drips and other contaminants. The standard product is transparent, fire-retardant & antistatic so that it can be used safely in a paint shop environment. It is also available in a variety of other materials and surface treatments can further enhance its existing properties. Moreover, its fabric-free construction eliminates the primary source of fiber contamination from conventional fabric covers. The RobotSaver™ can be changed quickly during normal production breaks, and its multipart design allows for replacement of various sections at differing intervals. No chemicals or laundry required. Transparency facilitates troubleshooting during normal production. Zippered construction allows quicker access for repair.